I won’t celebrate anyone’s death, but Prime Minister David Cameron’s claim that Thatcher “saved our country” and the £10 million state funeral (of which taxpayers will pay at least half the costs) are party political propaganda and a slap in the face to all the unemployed and disabled people facing benefit cuts today (1) – (2). The message is “She mattered, you don’t”. Thatcherites see themselves as radical reformers going up against “the establishment” and “vested interests”. For Thatcher this meant trade unions and public sector professionals like teachers, nurses, doctors and lecturers. For brave Chancellor George Osborne, a public school and Oxford University educated millionaire Chancellor of the Exchequer, it means the vast oppressive charities and churches who help the poorest (4). Thatcherites aim to roll back all the progress made by Atlee’s post-war Labour government and take us back to the 19th century with no trade unions, no employee rights, no welfare state and no NHS (these “only encourage dependency”) – back to the poorhouse, the workhouse and the poor dying of hunger, cold or illness and being blamed for their own suffering. It’s new only in rejecting the One Nation conservatism of politicians like Ian Gilmour MP (who condemned Thatcher’s policies and record in his book ‘Dancing With Dogma) and Prime Minister Harold MacMillan. So basic arithmetic shows there are no jobs available for over 80% of unemployed people in the UK ; but Thatcherites have never let facts or logic get in the way of an ideology which pretends that the most powerful and wealthiest have no responsibility for the massive effects of their actions, while the poorest and most vulnerable, who have no power or influence, are supposedly entirely to blame for every problem. Osborne claims people on benefits are all “shirkers” who don’t work (when many do) and don’t work by choice (8) – (9). This is exactly the same crap that was shovelled by Thatcher and her ministers in the 80s, when, after being elected on a campaign that promised to get unemployment down, they increased it from 2 million to over 3 million – and then people like Norman Tebbit told the unemployed to “get on yer bike” and get a job. Far from saving Britain, Thatcher caused many of our current problems. As the late Conservative MP Ian Gilmour pointed out, by raising interest rates to double figures to cool a financial sector boom in the South-East of England, Thatcher destroyed much of Britain’s manufacturing industry, which was pushed into recession by the resulting over-valuation of the pound (hurting exports) and unaffordable credit, leaving us over-reliant on the financial sector, which she began the deregulation of with the 1986 ‘Big Bang’ (this being the main cause of the boom, which was as much a bubble as the one that burst recently) (11) - (12). 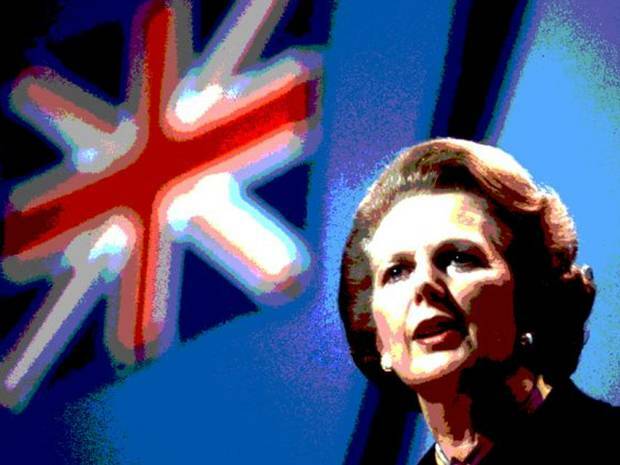 She closed down our steel industry, while other countries, like Germany, continued subsidising steel and other key industries, even under conservative Chancellors like Helmut Kohl. As a result Germany’s economy remains stronger and its unemployment lower than ours. She sold off valuable assets like British Gas and British Telecom, losing the government revenue which could have funded the NHS, public education and the welfare state. While it’s likely ideology was the main driving force for these privatisations, they also funded short term income tax cuts which helped her win elections. No wonder former Conservative Prime Minister Harold MacMillan accused her of “selling the family silver”. In fact it was worse than that. She sold the geese that laid the golden eggs. Her privatisation and deregulation of every economic sector led not to greater competition but to oligopoly – sectors dominated by a few large companies which took over smaller firms or pushed them out of business, before charging customers whatever they like due to informal price fixing or simple profiteering. For instance today a handful of energy companies dominate Britain’s market for electricity and gas for the domestic and business markets. While benefits for the poorest are cut and capped, these companies are allowed to charge whatever they like. They have doubled their profit margin by percentage on their average customer between 2011 and the first quarter of 2013 – under two years. The gap between their own costs and the prices they charge to customers rises constantly. The heads of these companies are rewarded with knighthoods (14) – (16). This is Thatcherism again. Those who have wealth are assumed always to deserve it, while those who are poor are assumed to be poor because they are lazy or spendthrifts. In reality some of the wealthiest people in Britain started off with wealth or a family with connections to get them jobs on the boards of big firms – and then used their own wealth, or the company’s, or the bank’s, to buy political influence with donations to party funds, effectively exempting their company or their entire sector from any significant regulation. (And no, I’m not saying this is true of anyone who has more money than average, some did work hard for it and take risks and pay their employees fair wages). She began the sale of council houses, without buying or building replacements. Today, due to the shortage of council houses, councils spend a fortune renting social housing from private landlords or paying housing benefits that go to those landlords in rent. This is the main reason for high benefits payments to some families – because most of it goes on housing benefit that goes straight into the pocket of private landlords – but David Cameron’s Thatcherite government is capping the benefits payments to people stuck in this situation as if this was their fault, rather than buying and building enough council houses (17). Every Daily Mail or Sun headline about asylum seekers or people on benefits living in mansions is a result of this policy, begun by Thatcher, but rather than blame her and her successors in government, they blame weak, powerless, easy targets instead. The attempt to present her as a great war leader in relation to the Falklands, with 800 members of the military to be present at her funeral, is especially hard to reconcile with the historical facts. When the Argentinians began talking of taking the Falklands in 1977, Labour Prime Minister Jim Callaghan and Foreign Secretary David Owen were persuaded by military chiefs to send a Royal Navy fleet to the South Atlantic to signal Britain would fight any invasion. The Argentinians backed down. In a similar situation in 1982 Thatcher’s government withdrew the last Royal Navy ship from the area during spending cuts, leading the Argentine military junta to believe Britain would not fight for the islands (18) – (19). They invaded – and then Thatcher declared war. Hundreds died as a result. Some suggest that Thatcher, then the most unpopular Prime Minister in British history, after increasing unemployment to over 3 million, wanted a war to restore her popularity (20). It’s impossible to know whether this was the result of blind ideology in imposing spending cuts and incompetence in not caring where they were made, or whether Thatcher wanted the Argentinians to believe Britain wouldn’t fight in order to get a war to restore her political fortunes. Either way she was responsible for an easily avoidable war and all the deaths in it. By any rational standard she should be condemned for not preventing war as simply and easily as Callaghan did rather than lauded for winning a war against an inferior military. In the case of the 1990-1991 Gulf War against Iraq, which Thatcher committed British troops to shortly before her party got her to resign over the poll tax, there is no such doubt. The Bush (senior) administration and the Kuwaiti monarchy duped Saddam into war with the US over Kuwait. Bush and his advisers sought to repeat Thatcher’s feat of going from unpopularity on domestic unemployment and recession to election victory on a tide of war fuelled nationalism ; they failed. The poll tax, which resulted in Thatcher’s resignation, was a local council tax under which everyone paid exactly the same amount irrespective of their income. It caused riots the last time it had been tried by an English ruler, in 1381, resulting in the peasants’ revolt. The Conservatives, who supposedly want everyone to know the history of Britain, seemed to be massively ignorant of it – they thought the poll tax was going to be hugely popular. Instead, as in 1381, it brought mass non-payment and riots. Thatcher, whose supporters claim she was acting on behalf of the “ordinary person in the street” showed she had no more clue what many of them wanted than medieval English kings knew of peasants’ needs. We’re told Thatcher was a “lover of freedom”. This is only true if you interpret freedom in the narrow neo-liberal sense of freedom for companies, banks and those with lots of money to do what they like – pay less tax due to tax cuts, avoid tax through tax havens, avoid regulation, charge customers whatever they want to, etc. She certainly opposed Communism, but her role in it’s downfall, like Reagan’s, was negligible. Dissidents and protesters in the Soviet bloc did far more, as did Gorbachev – and before him Brezhnev by spending so much on the Soviet military that he drove the USSR’s economy into the ground. Her support for “freedom” elsewhere wasn’t just non-existent – she was supporting , training and arming the forces of many dictatorships. General Pinochet aided the British war effort by allowing them to use Chilean ports. Thatcher treated him as an honoured friend after that, despite Pinochet having overthrown the elected government of President Salvador Allende in a military coup and having thousands of people tortured and killed. She condemned Nelson Mandela’s ANC as terrorists and refused to place economic sanctions on Apartheid South Africa, though we are assured that in private she was putting verbal pressure on South African Presidents to free Mandela. Sanctions would have made considerably more difference and much sooner. Thatcher’s government also provided training, tens of millions of pounds of money and dozens of jet fighter bombers to Mugabe’s military as he was massacring members of the tribes of his political opponents by the thousand. Perence Shiri, one of the officers who headed the genocide was subsequently allowed to come to Britain to train at the Royal Defence College. The massacres were played down by the Foreign Office as “exaggerated” (21) – (22). On top of this, British taxpayers ended up having to pay the £1 billion bill for Saddam’s purchases from British arms companies, as after the 1991 Gulf War there was no chance of his government paying – and Thatcher had approved the exports under Export Credit Guarantees (25). She signed the Al Yamamah oil for arms deal with the Saudi monarchy, which continues to be an absolute dictatorship imposing a medieval version of Islamic law – and torturing confessions out of suspects before executing them by beheading. Her son Mark Thatcher had a £1 million house purchased for him by a company based on a tax haven and owned by Wafic Said, a dodgy Middle Eastern arms deal broker. Said also gave Mark a £14,000 Rolex watch. Said’s wife donated large amounts to the Conservative party before the 2010 election . Mark Thatcher has denied rumours that he received millions more as part of the deal (26) – (27). Margaret Thatcher also sent the SAS to train the mass murdering Khmer Rouge’s monarchist allies in laying land mines in the 1980s (28). Supporting mass murdering dictators, monarchist allies of ultra-nationalist regimes guilty of genocide and governments which gave black people no rights whatsoever seem like strange ways to promote freedom, but then Thatcher never really supported freedom or democracy in the sense that most people use the words. Thatcher was the first post-war Prime Minister to divide Britain, largely through strident English nationalism thinly disguised as British nationalism, combined with constant attempts to divide the majority in order to make conquering them easier. Those who had jobs were encouraged to hate those who were unemployed as supposedly all lazy scroungers, while Thatcher continued to drive unemployment higher and higher. Those who worked in the private sector were told they should disdain public sector employees and trade unions as supposedly selfish “vested interests” – and the working class were encouraged to hate the middle class as effete namby pamby liberals who were meant to be out of touch with reality and had more education than was good for them. Hatred of foreigners, minority nationalities, religions and ethnic groups, as well as refugees and asylum seekers was also encouraged. This was all continued under Blair to some extent, with opposition to his policies also blamed on the “middle class” as if a bunch of former lawyers who were now on over £100,000 a year ministerial and Prime ministerial salaries weren’t middle class. Under Cameron we are back to all the divide and conquer tactics used under Thatcher. Thatcher’s period as Prime Minister did more than anything to boost support for Scottish and Welsh devolution and for independence for Scotland - and this has been cemented by the continuation of many of her policies by her successors. The Conservative party claim no-one should denigrate Thatcher’s record at this time. If they didn’t want her death and funeral politicised perhaps they shouldn’t have tried to use it for party political ends and to try to justify their current shameful policy of taking from the disabled, the poor and the unemployed to fund tax cuts for millionaires. Given the Thatcherite establishment’s shameless rewriting of history, politicisation of her death and funeral and attempt to use it to gain votes, the political opponents of the government have no option but to respond in kind. Margaret Thatcher has thousands of admirers who are senior politicians, journalists and editors telling her version of history and the present. They won’t be allowed to stop the millions of people who oppose Thatcherism, and those who suffered under Thatcher and her legacy under her successors, telling the other side of the story.